Frances Foster Books (Farrar Straus Giroux), 2013. 64 pages. 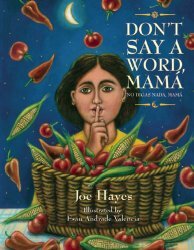 I got to hear Leonard Marcus speak about this material at the 75th Anniversary Caldecott Preconference last June in Chicago. 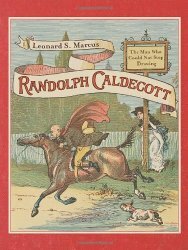 There and in this book, he tells why Randolph Caldecott completely changed children’s books, and why his name is a fitting title for the award for the most distinguished picture book each year. The book is filled with art work done by Caldecott and related images such as pictures of the places he lived or contemporary art work shown for contrast. Every double-page spread has at least two images, usually more. 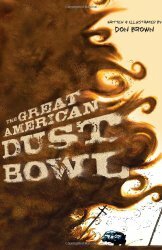 The format is large, like a picture book, but the text is detailed, like a chapter book. The material is varied as well, with sketches interspersed with watercolors and photographs. The story told is the story of someone who started out as a bank clerk but eventually doodled his way to a distinguished career as an artist who will never be forgotten and who made books for children all the more accessible. Hooray! My Harry Potter in German collection is now complete! 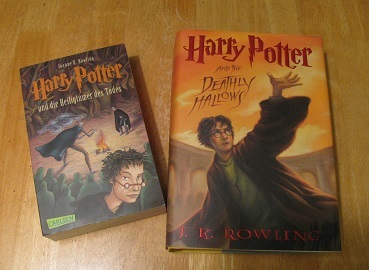 My son got back tonight from a Study Abroad program in Prague, and he brought me back Harry Potter und die Heiligtümer des Todes, Harry Potter #7, the only volume I didn’t have the German version of. So today’s Sonderling Sunday, of course, will begin this book. My son pointed out right away that the title, directly translated “Harry Potter and the Hallows of Death,” sounds better than the original English title, Harry Potter and the Deathly Hallows. He’s right. And I love the way Harry on the cover looks totally like a German teen! I’m amazed that the new volume, in paperback, actually is smaller and thinner than my English hardback. They used thin paper and small print, and there are no pictures at the chapter headings. My English book has 759 pages, and the German book 767, so there are still more pages in German, but just barely. = Die beiden Männer kamen aus dem Nichts, erschienen wenige Meter voneinander entfernt auf dem schmalen, mondhellen Weg. It’s good to be back with Sonderling Sunday! Have a hervorragende week! Listening Library, 2013. 8 hours, 19 minutes on 7 compact discs. Brava! 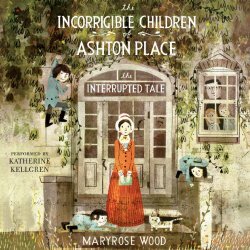 Another installment in the incredible series about The Incorrigible Children of Ashton Place. This series makes fabulous listening. I laughed and laughed during my commute, my only regret being that in my own car I had no one to share the joke with, and since I listened to it, I can’t quote hilarious bits in this review. The plot is outrageous, but told in all seriousness. Katherine Kellgren’s proper British accent strikes exactly the right note. In this fourth book, mysteries that have followed the Incorrigibles through the entire series are beginning to be uncovered. For the bulk of this book their governess, Penelope Lumley, is invited back to her former home, the Swanburne Academy for Poor Bright Females, just in time to learn of an insidious plot to change it into the Quinzey School for Miserable Girls. Meanwhile, the charming Simon Harley-Dickinson, he of the spark of genius, has been silent, captured by pirates, and the cannibal book from Lord Ashton’s library gains weighty importance. The plot is wild and unlikely – and oh, so much fun! The style reminds me of Lemony Snicket’s, only far more hopeful and uplifting. This is a series I highly recommend listening to, because you will appreciate its brilliance even more than if reading it on your own. Grove Press, New York, 2014. 343 pages. Another modern Jane Austen update! Very fun! Val McDermid takes the exact story of Jane Austen’s Northanger Abbey and writes it as Jane herself might have written it if she were alive today. Now, with Sense and Sensibility, Joanna Trollope took an Austen novel I wasn’t terribly fond of and translated to modern times, which had it make a lot more sense. In this case, Northanger Abbey is one of my favorite Austens (or at least in the top half, after Pride and Prejudice and Persuasion), but in translating it, it actually seems a bit less believable to me. 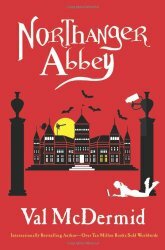 The original Northanger Abbey made fun of gothic novels. Catherine Morland imagined Northanger Abbey as the setting for one, and fantasized a sinister mystery in the family’s history. In the modern version, Cat Morland imagines that vampire novels are real. To me, it was a much bigger stretch that Cat would believe in vampires than that she’d believe a gothic novel was real. I don’t care how much a girl likes to read paranormal romances. I don’t think anyone would start believing they are real, no matter how mysterious the family. Other than that, it was again a good translation of all the situations to modern times. Though I have to face that I’m not crazy about the plot of Northanger Abbey other than the fun it has with gothic novels. The story of her supposed friendship with Isabelle Thorpe is a bit more painful. And while Val McDermid did give the final problem with the General a modern twist, she left in the foreshadowing of the problem from the original novel, which ended up falling rather flat. Still, Austen fans will enjoy reading the update. It’s a bit amazing how neatly the situations fit in modern life. And bottom line, we’ve got a light-hearted romance and the story of a young adult going out in the world for the first time and making new friends – some better than others. Atheneum, New York, 1975. 186 pages. Well, my co-worker opened up the floodgates when he decided to order Three Investigators books via Interlibrary Loan. That got me thinking about the other books I loved in childhood but that are no longer in print. 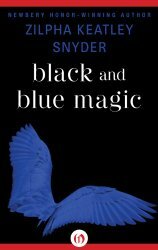 Many other books by Zilpha Keatley Snyder are still in print, so I don’t know why Black and Blue Magic is not among them. It’s the one I checked out from the library over and over again and dearly loved. And it was just as good as I remembered it! (A lot shorter than I remembered it, but just as good!) Harry Houdini Marco is clumsy as can be, always tripping or running into things. His mother says he’s just still growing, but all he knows is that he’s clumsy. And Harry believes that if his father were still alive, Harry would be a disappointment to him. Harry’s father was a skilled magician, and wanted Harry to be the same, which explains the name he was given. He even brought him to the Great Swami and got a prophecy that Harry’s “magic will be of a very special kind.” But Harry has tried doing magic tricks, and he’s just not coordinated enough. But then one day Harry sees a little man who’s clumsy lose his big suitcase on the bus. Harry gets off the bus and takes it to him. The man’s a salesman, so Harry recommends his mother’s boarding house. Before the man leaves, he gives Harry a magical reward. It’s an ointment, and when Harry puts a drop on each shoulder, he sprouts wings! Harry has to learn how to use the wings safely and unobtrusively. He’s accidentally seen by a few people, and it’s quite amusing the conclusions those people draw. This book is wonderful because there’s magic and adventure combined with character growth and personal problems that Harry is able to solve. It’s a delightful book about a good-hearted kid who finds out that special magic might make him a little black and blue. And it definitely stands the test of time. Amulet Books, New York, 2012. 126 pages. This is the second graphic novel about Mirka, an 11-year-old Orthodox Jewish Girl who dreams of fighting monsters and having adventures. At the start of the book, she’s grounded because of her adventures in How Mirka Got Her Sword. And just as soon as she’s ungrounded, she goes looking for trouble again. And finds more than she bargained for. 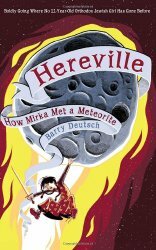 A meteorite is hurtling toward Hereville, about to kill everyone. Mirka gets the witch to help – and she transforms the meteorite into a girl who looks just like Mirka. And the meteorite, to whom they give the name Metty, is faster and stronger and even cleaner than Mirka. At first it seems like it will be nice to have a double, and Metty can do chores and other unpleasant things. But it doesn’t turn out so nice. For starters, they can’t both show up at meals or Mirka’s stepmother would find out what’s going on. So Metty gets the first few meals. That’s only the beginning of the troubles. Margaret K. McElderry Books, New York, 2013. 64 pages. Here’s children’s nonfiction at its incredibly cutest. In a sleepy corner of Costa Rica there’s an upside-down world where sloth is a virtue and not a sin. A sanctuary – the first in the world – devoted to saving this much maligned animal. Home to one hundred and fifty orphaned and injured sloths, Slothville is an idle idyll where the sloths’ every whim is catered for by the celebrated sloth whisperer Judy Arroyo. This book reveals some of the secrets behind the sloth’s smile and introduces you to a handful of the sanctuary’s superstar sloths. I think we have much to learn from their mellow ways. So take a break from the hectic world around you, kick back, relax, and enjoy hanging with the sloths. The picture-book-sized pages in this book feature large photographs of baby sloths. Baby sloths are cute. Very cute. Along the way, we learn lots of facts about sloths, like the two main types of sloths and how much of their lives they spend resting (70%). Did you know that sloths aren’t monkeys or bears, but Xenarthrans? 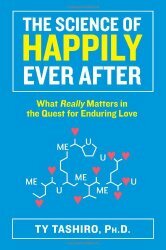 I didn’t until I read this book. 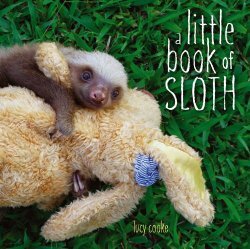 This book is hard to resist, simply from all the pictures of the cuddling, laid back sloths. Reading it may be all it takes to get you to join the Sloth Appreciation Society. You are currently browsing the Sonderbooks blog archives for June, 2014.